KiVa includes role-playing exercises to increase the empathy of bystanders. Many programs to reduce bullying in primary and secondary schools have proven ineffective, but a new UCLA-led study finds one that works very well. The study of more than 7,000 students in 77 elementary schools in Finland found that one program greatly benefited the mental health of sixth-graders who experienced the most bullying. It significantly improved their self-esteem and reduced their depression. 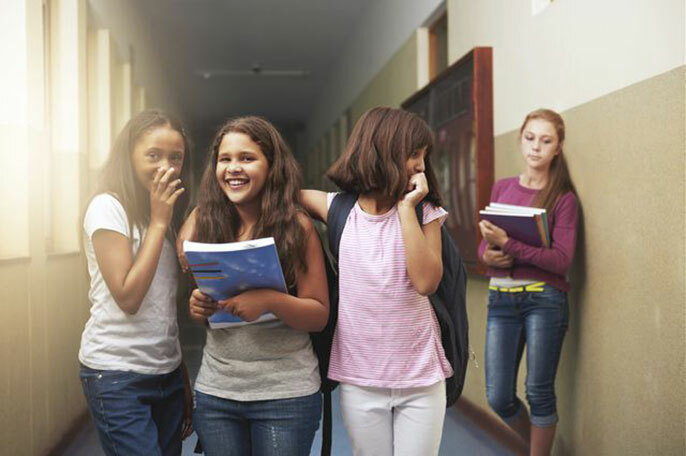 KiVa is one of the world’s most effective anti-bullying programs, said Jaana Juvonen, lead author of the study and professor of psychology at UCLA. “Our findings are the first to show that the most tormented children — those facing bullying several times a week — can be helped by teaching bystanders to be more supportive,” Juvonen said. Thirty-nine of the schools in the study used KiVa; in the other 38 schools, students were given some information about combating bullying, but these efforts were much less comprehensive. Anti-bullying programs are typically evaluated based on whether they decrease the average rates of bullying. Until this study, no school-wide programs have been found to help those who most need help — children who are bullied repeatedly. KiVa significantly reduced the depression of the 4 percent of sixth graders who were bullied most frequently — on at least a weekly basis. The researchers also found improved self-esteem among the approximately 15 percent of sixth graders who had been bullied at least a few times per month. A recent meta-analysis of 53 anti-bullying programs worldwide found the KiVa program to be one of the most effective. The odds that a given student experienced bullying were 1.5 to nearly 2 times higher in control schools than in KiVa schools nine months after KiVa’s implementation. Students in all grade levels studied, fourth through sixth, benefited in terms of having significantly more favorable perceptions of the school environment. This was especially true for the students who were most frequently bullied before the intervention. The study is published online in the Journal of Consulting and Clinical Psychology. Juvonen does not advocate zero-tolerance school policies, which she said punish students but do not teach them about bullying. KiVa is much more effective in leading students to be kinder to one another, she said. KiVa is now Finland’s national anti-bullying program. It is being tested and used in several other European countries, and it is being evaluated in the United States, Juvonen said. It is based on scholarly research about bullying, including Juvonen’s, but she was not involved in developing the program. The study’s co-authors are Hannah Schacter, a UCLA graduate student in developmental psychology; Miia Sainio, a senior researcher at the University of Turku, in Finland; and Christina Salmivalli, a professor of psychology at the University of Turku and the developer of KiVa. • People on social media are often unsupportive of cyberbullying victims who have shared highly personal feelings. • Bullies are considered the “cool” kids in school. • Nearly 3 in 4 teenagers say they were bullied online at least once during a 12-month period. • Nearly half of the sixth graders at two Los Angeles–area schools said they were bullied by classmates during a five-day period. Journal of Consulting and Clinical Psychology: Can a school-wide bullying prevention program improve the plight of victims? Online bullying: Why don't people intervene?